G7 is Idealliane’s industry-leading set of specifications for achieving gray balance and is the driving force for achieving visual similarity across all print processes. G7 is a specification and is listed as Technical Report (TR) 015 in ANSI/CGATS. 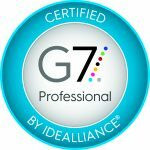 Idealliance certifies our industry’s most knowledgeable experts to qualify leading providers of print, creative, and prepress services in the G7 methodology. The G7 method outlines an easy-to-follow recipe for implementing ISO printing standards and additional metrics. The result is a simple but powerful way to match from proof to press. G7 is both a definition of grayscale appearance, and a calibration method for adjusting any CMYK imaging device to simulate the G7 grayscale definition. G7 is a method to ensure a similar appearance across multiple devices. G7 is used to consistently hit desired color targets. G7 is device independent. The G7 neutral print density curve (NPDC), gray balance definitions and calibration methodology are the same for any imaging technology, regardless of substrate, colorants, screening technologies, etc. G7 is designed to align all processes, substrates, and inks. 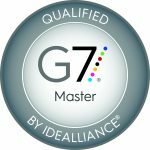 A G7 Master obtains an internationally recognized qualification from IDEAlliance that identifies print companies that are able to control their graphic production processes and deliver the color quality that the print buyer is looking for. Achieving the G7 Master qualification is an added value for the producers and buyers of printed matter, for the former it means saving materials as well as increasing production, and for the latter it is a guarantee that they will obtain the color and quality they are looking for. Likewise, if you are a buyer of printed materials and you hire a print producer qualified as G7 Master, you will obtain the guarantee of quality, repeatability and consistency in the color of your products that you are looking for. A G7 Expert has demonstrated expertise in the field of color management, process and quality control for proofing and printing utilizing the G7 methodology. A G7 Expert is able to analyze color and print related issues and take corrective action to bring systems and processes in control to a set method, standard or specification with repeatable, predictable results. A G7 Expert has attended and successfully completed an Idealliance G7 Expert/Professional Training Course. A G7 Professional is a quality internal technician who takes the lead as G7 in your company, is trained to calibrate and maintain all the devices within the plant in G7, you can complete the work to request that your plant qualify as a G7 Master, but for the final qualification must have a review and approval of a G7 Expert, who will be responsible for approving and submitting the qualification data. A G7 Professional must have the support of a G7 Expert to carry out the G7 Master qualification process for the printing plant for which it works.